Are you looking for ways to remodel your bathroom, more specifically your shower? You likely are looking for the best shower curtain rod. For those who are not aware, a shower curtain rod is the horizontal rod above the shower that holds the curtain, while also helping it open and close properly. There is a lot to consider about shower curtain rods, from how they look in your bathroom, to how they perform when you step into and out of the shower. You also want to consider what material rod you need as well as one that is easy to install. You want to find overall shower curtain rod for your bathroom, and that is exactly how we would like to help you, today. In this review, we will be reviewing six shower curtain rods from brands such as Ex-Cell, Safety Innovations and Bino. We will show you each shower curtain rod’s strength in addition to their weaknesses. We will then declare the Top quality shower curtain rod that is well worth your investment for your bathroom endeavors. Without further ado, here are the shower curtain rods that we will be reviewing. InterDesign has made the first shower curtain rod that we will be looking at. This one is available in many different sizes and colors, including white, black and bronze. The size we are reviewing is one in between 50 to 87 inches in length. This is a retractable show rod that comes in two halves. To install, extend the rod to both ends of your walls and twist to lock them in place. This is a fairly easy way to install the rod with no power tools required. The curtain rod is made of a combination of steel and plastic. The rod looks great and will not rust from water or moisture, which can especially be concerning when it is above a shower or bathtub. If you prefer this to be hung in front of a closet, specifically a walk-in closet, you can do this as well with this shower curtain rod. If your closet doesn’t have any doors, you can easily install this between two walls and put in some appealing, walk-through curtains for a bedroom makeover. There is a spring mechanism inside of this shower curtain rod, and it can be very stubborn to handle. This makes it more difficult to install the rod when you otherwise would prefer a hassle-free experience. Is free of rust and corrosion. Not as easy to install. Allzone’s shower curtain rod is only available in white and comes in two sizes. The size we are looking at is the bigger size: 43 to 83 inches in length. Like Interdesign’s shower curtain rod, this rod is retractable. This is an easy to install shower curtain rod that requires no drilling or nails. Just extend it out from wall to wall and twist it to lock it in place. These rods can hold up to 20 pounds, and can even hold heavy curtains to separate beds inside a bedroom or suite. They also can be easily installed on many types of walls which include wood, drywall and tile. The unique feature about this shower curtain rod is its unique button design. This locks the rod in position so that it doesn’t move, slip or collapse out of place. This simple adds another layer of defense from a costly mistake that might happen. The button hole feature is its greatest strength, but it is also its greatest weakness. There are various holes throughout the rod for the button to go, and this means that your rod must exactly fit inside your walls or else it won’t ever. If you even have a little bit of room, that’s no good. Has a button lock feature. Can carry a heavy curtain. Button lock feature is limited. InterDesign has a second shower curtain rod for it. This one is finished with brushed stainless steel, and can retract from 43 inches short to 75 inches long. This also is a retractable shower curtain rod. This is a corrosion and rust resistant rod that is made of stainless steel and plastic. The brushed finish also made it more eye-catching in more traditional looking bathrooms, opposed to no finish or a chrome finish. This is the typical twist curtain rod that adds tension when you twist the two parts from wall to wall. They guarantee that this rod will not slip or collapse out of place. While this is a nice shower curtain rod, achieving the tension that you need in order to make it work can be rather difficult. Depending on the length of your walls, or what kind of walls you have, the tension can be easy to achieve or nearly impossible. So you are not even guaranteed whether or not this will even work with your bathroom. Tension is hard to achieve. Bino has a shower curtain rod that is available in two different finishes. You can choose a polished chrome for a modern look, or a brushed nickel for a slight timeless look. This rod has a beveled look to it that gives it more detail on the ends. Overall, the look is nice. Bino’s curtain rods are retractable, meaning they can shorten and lengthen by simply pushing or pulling them. This shower curtain rod can fit in openings that range from 42 to 72 inches in length. By twisting the two halves of the rod, you tighten and lock it into place. This makes the rod easy to install with no tools required. It is easy to install as it is to remove. Don’t worry about the rod un-twisting itself and falling off. The rod requires three to four full revolutions for it to be fully locked. The rod is made of steel overall. Steel is resilient as it is tough and appealing in the bathroom. One thing to keep in mind, though, and that is that this isn’t stainless steel. This rod will simply rust over time. The only way to prevent rust is if you dry the rod off after showering, and we know that many many people have the interest in doing do. Another solution to this is to buy a can of clear coat and put a coat onto this rod every now and then. Is available in two finishes. This rod can easily rust. This next shower curtain rod is from Ex-Cell. This is a more simple shower curtain rod that has a brushed nickel finish. This rod comes with a pair of brackets that can turn. With that in mind, you can use this shower curtain rod on parallel walls or walls that face one another. You can even consider installing this shower curtain rod on the ceiling for something different in the bathroom. All you need to do to install this rod is drill the brackets into the wall with a power drill and snap the rod in place. This rod is adjustable from 40 to 72 inches in length. Just like Bino’s shower curtain rod, this rod can greatly suffer from rust. If you have a can of clear coat, you can spray a layer of it on to prevent rest for the time being. If not, then you will need to wipe the rod dry after every shower. Can be installed on any kinds of walls. Last but not least, we have not a rod, but a pair of shower rod mounts. These are a pair of rubber pads with textured grips. They are meant to reinforce the tension of your existing rods and hold them securely without any risks. These mounts were not made with design in mind, though. These mounts can work with shower curtain rods that are up to one in three-eighths in diameter. On the back sides of these mounts, you have these suction cups that can easily stick to your walls. They are easy to get on, but hard to get off. No tools are required, and installation is simply a snap. Furthermore, you can put these rubber pads on any type of walls in any way that you see fit. The first problem we have with these mounts is simply that there is no shower curtain rod included. You will need to buy a new shower curtain rod, or use this existing rod, in order to utilize these rubber pads. The next problem that we have is their design. The color is not really that appealing, unless you had an all white bathroom wall and shower curtain rod. No shower curtain rod included. Here are some tips for you as to how to choose a shower curtain rod for the bathroom. There are various characteristics of a shower rod to consider. Look for a rod that will go well with the rest of the decor inside your bathroom. Elements like colors and wall coverings, as well as finishes should affect your decision. Your towels, the rug and your shower curtain, with its colors, style and patterns should also be taken into consideration so that you have an appealing looking bathroom overall. You would like your shower rod to not only look great, but to do the job right all the time. 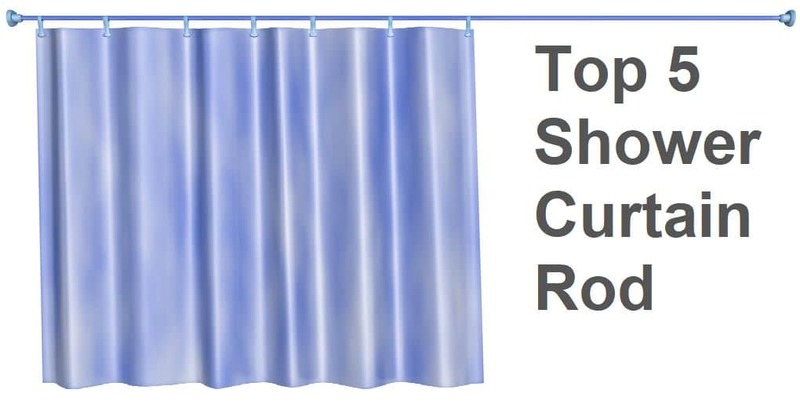 Shower curtain rods should be manufactured to be strong enough to hold up not just a shower curtain, but also wet towels. These rods come in a myriad of materials that can also improve the look of your bathroom. Most rods are either made of metal or plastic, although a distant third place is wood. Plastic rods come in various colors and are more affordable than metal, however, they are not as durable. Metal rods come in finishes, rather than colors, such as brushed nickel, chrome and bronze. The material of your wall is also a big consideration for choosing a shower curtain rod. For example, if you have tiled walls, a tension rod is the best choice for you, on account of tension adhering to the wall with a good deal of friction. THis also does not require you to use mounts that require you to drill any holes into your wall. If you prefer to have more room in the shower, you would like a rod that curves outwards. If your tub is in a corner of the bathroom, you will need an L-shaped rod. To be sure that you have the right size, measure your shower area accordingly. One thing to consider is that you can make a large rod smaller, but you cannot make a small rod larger. Many shower curtain rods come with some concerning faults, such as difficulty to install or other flaws. The biggest flaw with this rod is one that you can avoid, though. Rust can be avoided in one of a few different ways; Wiping the rod dry after use, applying a can of clear coat or using a dehumidifier in the bathroom. Bino’s shower curtain rod is beautiful to look at, at a great bevel design, and comes in many different colors. It will not cave under pressure and it is fairly easy to install without any setbacks or roadblocks. That is why Bino’s shower rod is the one that we most recommend to you. COPYRIGHT © 2018 · Toppickguy.com · ALL RIGHTS RESERVED.